Why? Because aerial media breaks free from the clutter on the ground below and gets an advertiser’s message across in a clear, eye-catching fashion. Furthermore, 70% of stadium attendees remember seeing the messaging on a banner, that’s the highest percentage rate-of-recall of any traditional advertising medium. 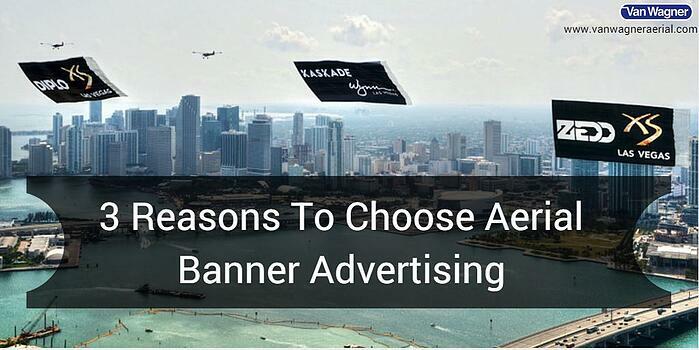 There have been a variety of case studies conducted to determine the effectiveness of aerial advertising, and the studies all arrive at similar conclusions—it works because it is unique, compelling, and people are excited to look up and take notice. Advertisers spend thousands of dollars on stadium naming rights and sponsorship deals. While sponsorships are suitable for some brands, they aren’t always a good fit for others. Aerial media provides solutions to both sponsors looking to elevate their involvement, and advertisers looking to simulate sponsorship exposure at an event. Let’s say you are sponsoring the San Francisco Giants, by flying repeated aerial advertisements before and after the game, fans will be aware of your brand even when they’re not in the stadium. Now let’s imagine that you are a local car dealership looking to sponsor summer fun in your region. By flying the Giants games along with local beaches and state fairs, you will drastically improve brand recall and capture the attention of consumers when they are in a happy state of mind. Advertising costs at major sporting events like the Super Bowl are typically somewhere in the millions. You can produce your banner and fly it all across the country at major events for a small fraction of the cost of a traditional marketing campaign. Furthermore, you can use your airplane ad to complement an existing campaign or run a regional promotion. Ask us about our proprietary snipes which allow us to tailor the messaging on your banner toward a specific audience or region. We are happy to help you get started, contact us today or click below for a free quote!